Details of the BNU's academic course and activities can be accessed at its web site: www.bnu.edu.pk. 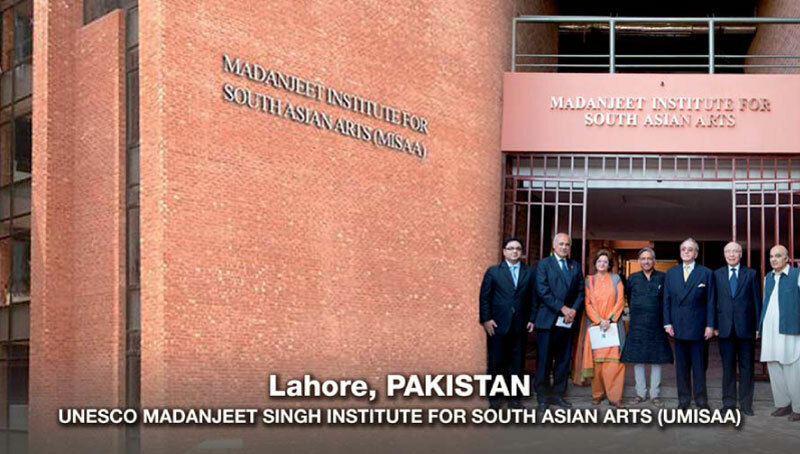 Applications for the SAF Madanjeet Singh group scholarship at BNU should go through the secretary of the board of your respective country and get the approval of the Chairperson. Third person from left: Prof. Salima Hashmi, SAF Chairperson Pakistan with the students of the SAF Madanjeet Singh Group Scholarships at BNU, Lahore. Chartered by the Government of Punjab, it was established in 2003. BNU is planned as a non-profit, world class university disseminating learning and encouraging research in diverse areas where the essential focus of the programs offered has been determined by the type of the work force identified for the future economic, business, academic, cultural and technological advancement of the region. As such, BNU offers students a range of subjects. The School of Visual Arts at Beaconhouse National University welcomes new forms of visual experience which require experimental and lateral thinking. Together with ScAD (the School of Architecture and Design), BNU encourages a multi-disciplinary approach as a way to explore the connections between art and different branches of knowledge in the humanities and sciences. Our rigorous curriculum focuses on the development of each student, ensuring a strong skill and intellectual base. BNU strive to make certain that students are visually articulate and self-motivated with the confidence to express their ideas. Providing a supportive atmosphere where promising individuals can achieve their creative potential is a matter of priority for the School. 1. The School of Visual Arts at the Beaconhouse National University in Lahore is hosting 15 students from SAARC (only one from India). 2. BNU is a Liberal Arts University, the first of its kind in Pakistan, with highly qualified faculty from Pakistan and Europe. c) Lack of selection criteria and infrastructure in each of the SAARC countries. 4. The students from Afghanistan, Bangladesh, Bhutan, India, Maldives, Nepal, Pakistan and Sri Lanka participate in the SAF Group Scholarships of Beaconhouse National University. 5. Cost of art materials is very high, and apart from materials used *in class, each student wants to experiment with art materials in their free time. This is not covered by scholarship funds. BNU is subsidizing their costs, but cannot do more than the current level of subsidies. 6. Five of the SAARC students are desperate to continue their studies at BNU. The University is willing to continue with its current level of subsidy, but not beyond that. it is recommended that SAF Chairpersons may grant five scholarships in addition to the current sixteen scholarships, making it a total of twenty one art scholarships for the year 2004 - 2005, with the proviso that these five students show satisfactory levels of progress, they may be given scholarships for two subsequent years allowing them to graduate with a Bachelor's degree from the University. a) Talent in drawing/ painting. c) Completed 12 years of schooling. 8. Selection process be initiated by March/April every year. Names of qualifying candidates be communicated to SAF Chairperson/ Secretary by end of May 2004. Passport details by June 2004. 9. Travel bookings to be completed by 15th August 2004 by each SAF country. Arrival of candidates by 14th September 2004. 10. Each student to be given $40, for travel and emergency expenses plus air ticket by each SAF chapter. (Visa fees also to be paid by each SAF chapter). All of the above to be reimbursed by SAF Headquarters on request by each SAF chapter. 11. Chairpersons may look at the Madanjeet Singh Art Scholarships as a cultural bridge between SAARC countries, in which artists and visual communicators; of the future will have shared each other's histories and cultures in an academic environment. They will have formed friendships parallel to understanding the nature of regional conflicts and the imperatives for a peaceful future - their own future.